I went around showrooms and searched online to find the kinds and sizes of models that roll stably when weighted down and meet my working needs and standards. Anyone serious about doing jobs well ought to do the same. A well-designed and moveable tool chest will enable you to become a more effective craftsman. A durable model will see fewer repairs to worn and broken parts. With a capacious and well-organized tool chest, you will be able to finish tasks more efficiently, for a satisfying boost in workflow. Having the best tool chest around is particularly handy if you run a busy shop. In this section, we list a small but useful selection of tool chest reviews, featuring various configurations and features that are designed for easy access. **Below, you'll find my more detailed reviews about the tool chests, but you can also click the links above to see current prices or read customer reviews on Amazon. We review all these products here while spelling out the strengths and issues of each product. With its luggage-like portability and easy access, Stanley’s 020800R is the best tool chest for the occasional gig elsewhere. For some jobs, you have to take your tools to another site or to elsewhere around home. For these times, that large rolling cabinet in your garage will be too much to move. 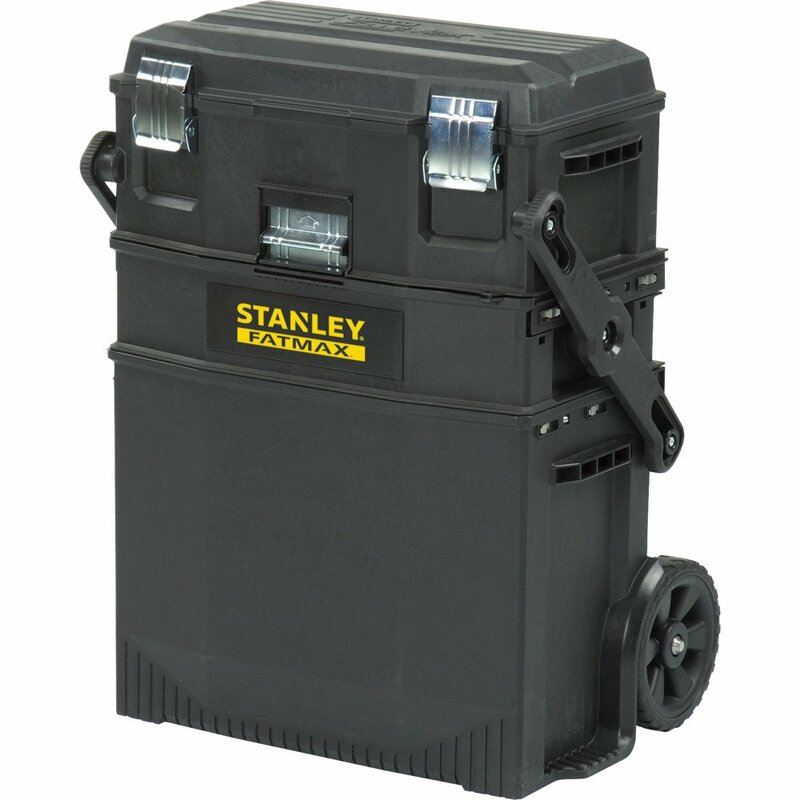 Stanley’s portable tool chest has a number of professional features that are useful for occasional work away from the garage. The strength of this rolling toolbox is its luggage-style shape and telescoping handle makes it easy to schlep this chest through rooms and streets. Dual large wheels make it transportable over ground you can walk on. Another advantage is the embedded V-groove design on its lid, with which you can hold shorter pipes and wood members for a quick cutting job. Made of lightweight yet robust structural foam, you will have little trouble rolling this portable tool chest to where you’ll need it. The chest has a manageable weight of around 23 pounds for easy portability where larger boxes fear to tread. The latching mechanism quickly secures the entire cabinet with its easy push-to-close mechanism. Four different-sized storage spaces at various tiers are immediately accessible once you slide to open up the cantilevered frame. Small items can go into topmost bin, which also features a handy tray for storing collections of smaller tools parts. Bigger items can go into the largest and deepest compartment at the bottom. This is obviously a tool designed for serious tool users, and is likely best portable model available to consumers. The Stanley 020800R FatMax 4-in1 Mobile Work Station may not be right for heavier shop work, but it is the best tool chest for jobs far from home. An affordable chest that would be a good addition to any garage is Homak’s BL04011410, our recommended budget choice. 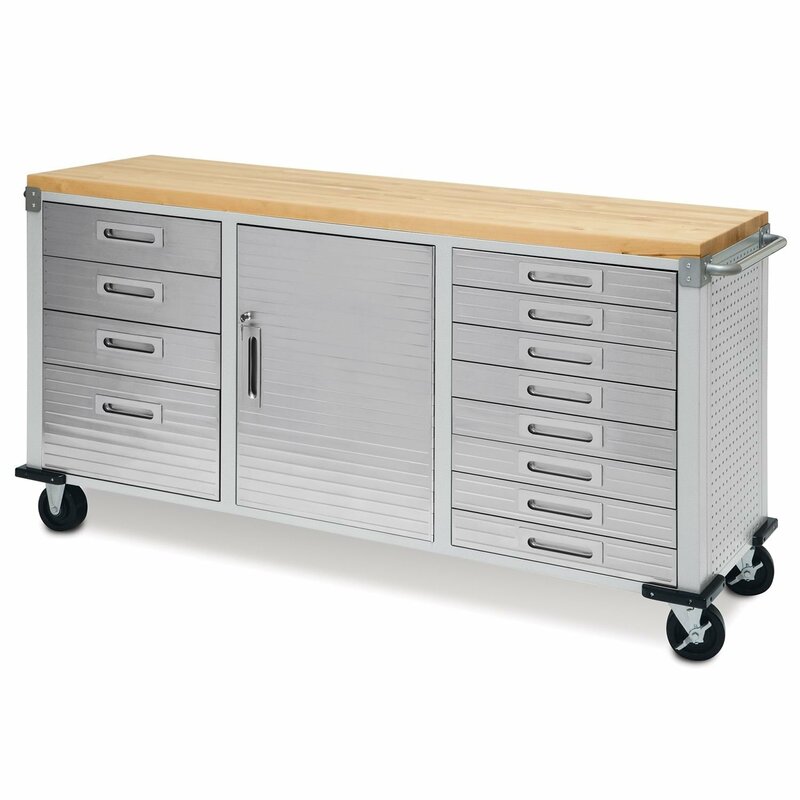 You don’t have to spend much for a rolling tool cabinet of decent quality, and Homak’s BL04011410 41-Inch Pro Series 11 Drawer is a good example of this. It’s a value-for-money alternative if you need to keep a lot of stuff tidy in compartmented storage. 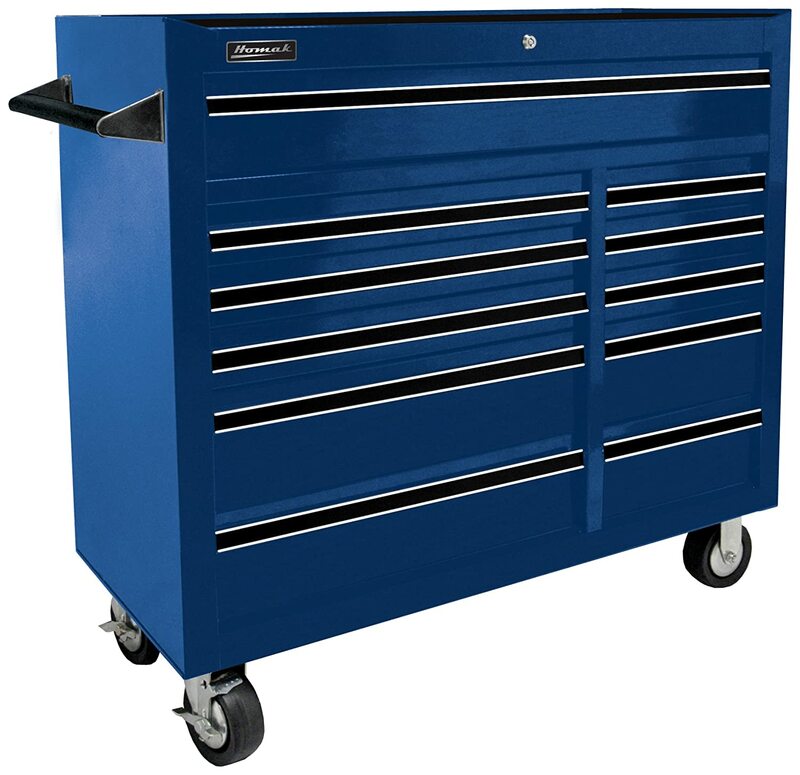 This is a serious tool chest with eleven steel drawers that is designed and built to last many years. The body and eleven drawers are made of durable, heavy gauge steel, with full-length solid aluminum handles. A high-security tubular locking mechanism has been integrated to hold your valuable tool away from prying eyes and hands. All exposed surfaces have been powder-coated to resist scratching and rust. There’s a convenient top mat supplied to prevent scuffing. The blue power coating certainly stands out and it will embolden the look of any garage. Of the four sturdy five-inch rubber casters, two swivels and have foot brakes, while the others are fixed in place. Some drawer liners did not hold in place as well as others, but otherwise, everything worked out nicely. The Homak BL04011410 41-Inch Pro Series 11 Drawer is not priced as much as the higher end shop cabinets, but it mostly works just as good. Of the proven tool chests, it’s our budget pick for light-duty and DIY jobs. 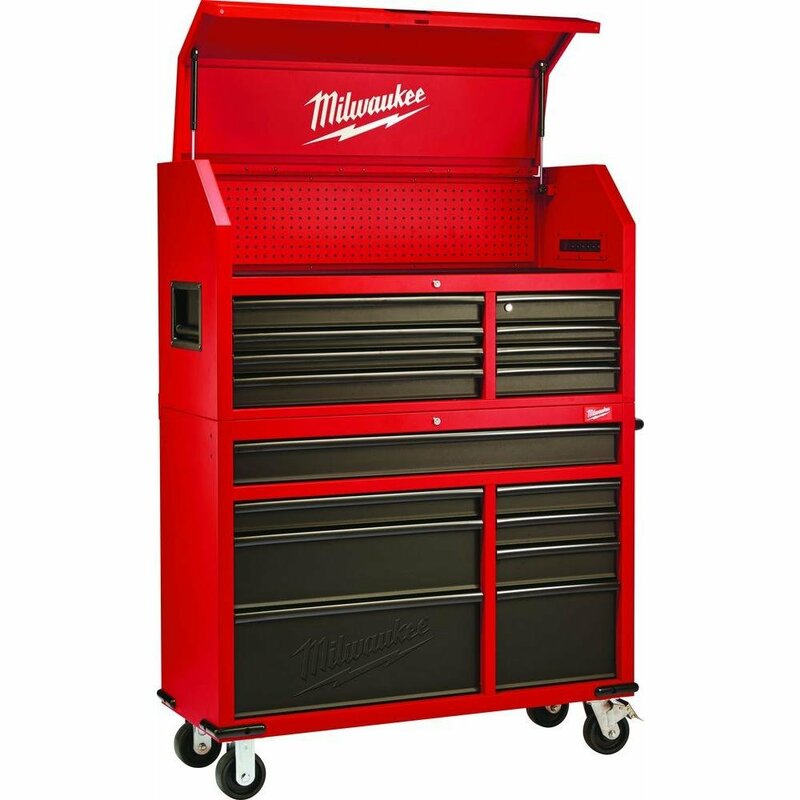 Of the bigger models available from well-known brands, Milwaukee’s rolling tool chest is a popular choice. This is the kind of serious cabinetry that’s typically found around the benches of good mechanics. If you have a ton of shop equipment or are into the repair trades, you will find proper storage like this compelling, and it is comparatively affordable. Combining both rolling cabinet and chest, both types of storage will prove handy at various times and for different gear. The heavy-gauge steel frame with reinforcing welds has 16 spaces of various dimensions and types, able to support a load of up to 1,800 pounds in total. In the topmost chest, a board mounted with pegs is convenient for hanging odds and ends, and there’s a convenient power strip as well as a rubbery liner to stop scratches. One of the top drawers has an independently locking mechanism, while another is actually a pullout work tray with a storage compartment below. The bottom drawer on the right offers an organizer for drills and chargers. The chest’s top and side handles are robust and well designed. The top drawers are unlocked with keys that are different from those for the lower drawers. Probably the coolest feature is the secret drawer underneath the lid that comes with its own lock. The independently locking right-side top drawer uses the same key as the rest of the top section. Nearby holes can be used to mount Milwaukee-brand battery chargers close to the power strip. Along the right side near the cabinet’s bottom is a second power strip. There are a very few reports of drawers bumping against the interior power cable runs, however. You will be making quick work of professional jobs with this tool chest. The Milwaukee Heavy-duty, Drawer 16 Tool Chest 46 Inch is a well-rounded cabinet that most garage owners will find worth the cost. Knowledgeable guys like to store equipment in chests with wooden surfaces. These absorb moisture that would otherwise affect their tools, leading to rust that’s commonly seen with metal cabinetry. Seville Classics’s Workbench is in this pleasing tradition. It has a high price to match its great features, but if you’re a pro mechanic or contractor who profits from your craft, only the best tool chest will meet your needs. The top work surface is a solid slab of hardwood that matches a heavy-gauge steel frame and drawers, and the organic look will go well with many craft shops. It is much recommended due to its wood top design and robust construction that offers the capacity of similar-sized cabinets. The twelve drawers glide on heavy-duty ball bearing sliders and are organized in rows that make it easier to retrieve whatever you need. The lockable center cabinet has interior shelves that can be adjusted to fit larger items. The spacious top is great for efficient shop work. Powder coating that’s resistant to fingerprints is applied to many exposed parts. The drawers’ front panels and their handles are fabricated with a grade of stainless steel that performs as well, and rubber liners protect from scratches. The huge 5-inch rubber casters steer well under heavy loads. The one downside is that only two swivel and has foot brakes. There is no integrated power strip either, but mounting one is easy enough. Busy workers work best with professional-grade rolling cabinets like the Seville Classics UltraHD 12-Drawer Rolling Workbench. It will likely become your go-to storage for tools and parts that need to be kept nearby, and is our overall choice for the best tool chest. A well-made and tool chest with multiple drawers and that rolls around to wherever it’s needed is very satisfying to use. It’s a sizeable investment, but will be a very useful one if you’re a serious tool user with a lot of jobs on schedule. Most tool chests are built to last, but a warranty by a big-name manufacturer can give you peace of mind. These premium industrial brands can be called to come over and repair their signature models, should they break under warranty terms. They will be priced high to match the premium construction and service, though. We cover here a few things that should consider before choosing a tool chest. Among the first things to consider when looking at a model is the quality of its design and build. Check the materials used in its construction to see how nicely is it assembled. The drawers will have to hold a very heavy load of items and still open and close smoothly. Look for wider drawer slides with more ball bearings in the mechanisms, girded front panels on the lower drawers, and double wall construction in parts. Gusseted channels reinforcing the areas where each wheel is bolted on can accommodate a heavier weight, allowing you to load up the frame to capacity without deforming the lower drawers or buckling the undersides. Locks on individual drawers are good for securing the more valuable or dangerous tools, and many chests have locks for a number as well as a master lock for the whole cabinet. The best designs have durable features such as heavier gauge steel construction and stainless panels, as well as rolled drawer edges. Having tools organized and parts ready in the various compartments will come in handy most days. You will be able to accomplish more tasks right off. The idea is to keep the floor where you are working clear of items and open for the manhandling of large assemblies. Steel is commonly used in the frames of cabinets for its sturdy and weigh-bearing qualities, along with aluminum fastenings and rubber casters. One critical feature not to be forgotten is the cabinet’s wheels, or casters. For most homeowners and many shops, heavy tool chests are best configured to roll around to various sites when required, remaining stable at all times. The casters should be made of high-quality polyurethane rubber and not just plastic, in order to support the heaviest loads. Foot brakes make things easier to handle and the best mechanisms are made of steel. Large rubber wheels with sleeved steel axles will ensure the cabinet will keep rolling smoothly for years to come. Figure out which model has the drawer count, sizes, and arrangement you need for storing things. Also, compare capacities and loads that you will need to store the types and quantities of tools you have. Consider not just your current inventory, but also how your collection of tools might grow over time, and select accordingly. What are the various drawers for? Having several drawers at your disposal will let you separate collections of tools from parts and supplies, making items easier to find. Smaller drawers are good for tinier items such as screws and nails as well as wrenches and screwdrivers. Deeper and wider spaces will readily hold bulkier hand tools, including grinders, routers, and drills. Here is a guide to organizing tool chests. By investing in a rolling chest with a design and capacity that compels you to use it, your enhanced efficiency will pay off in greater satisfaction over time. The features of the product are great. The affordability of this product is also a plus. And since it has the highest customer rating, I think it indeed has the ability to satisfy the needs of those with many tools. Looking for the best rolling tool chest is definitely important once you want to be organized. Though you don’t have a big tool collection or you are not using your equipment a lot often it would be a wise decision that you consider the best tool chest. If you liked this article, feel free to leave comments and let us know what you read in our tool chest reviews.